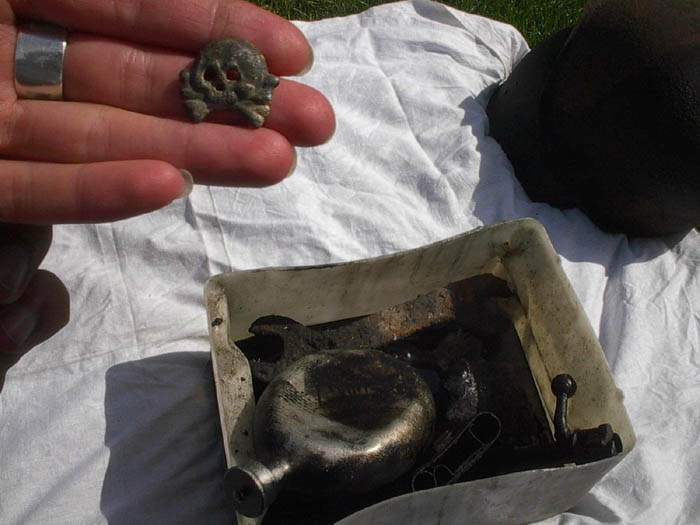 A small skull and crossbones emblem was worn on the uniform of German tank units. This one is clean. The rest of the items are soaking in a special mixture, waiting their turn to be cleaned and to tell their stories. 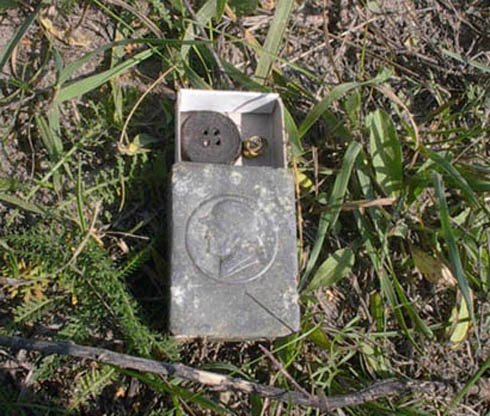 This is a standard German army match box. The items inside were found when I set my metal detector for jewelry and then went through the fields. I didn't find a silver ring, but I found a gold tooth. Next is a button from a Russian padded jacket. There are plenty of them on the hills of Bukrin. Civilians were forced to take part in the Korsun battle as well. Around 30,000 of the dead were civilians. They were from neighbouring towns and villages where all the archives were destroyed. Now we don't know their names, neither do we know how many died. All that is left of those people can be placed in a matchbox. The worst possible outcome for an army commander is to surrender. Their deeds are in shadow, names not often mentioned, their actions unexcused regardless of their guilt. 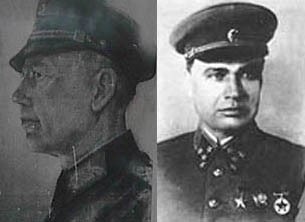 On left photo is German General Stemmerman, the commander of a surrendered army in Korsun and on right photo is Kirponos, commander of Soviet army that died in 1941 in a marsh. Both commanders have been a victims of the situations which Hitlers and Stalins Headquarters created for them. They had a chance to leave on airplane, they refused this offer and both died with their soldiers. Below is a German Iron Cross, second class (Eisernes Kreuz). The iron cross was only issued in times of war. The year 1939 indicates the beginning of the war. Prior to that there were the Iron Crosses of 1914 and 1870. 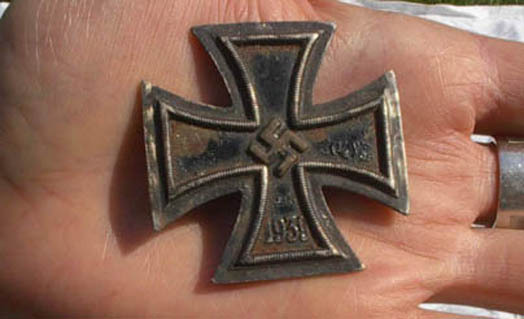 The Iron Cross was Hitler’s first medal. He got it in 1914 while a corporal in the German army and was extremely proud of it. Maybe because it was the only award he truly earned, at a time when he was in his right place. All the following history of the Third Reich is evidence of what can happen if a man born to be a corporal becomes the Fuhrer.